Firewood is weird stuff. It’s wood, from a tree, but we just throw it in the fire to warm us up. I wonder if a tree would rather be firewood or a table. We get a load of wood in late summer, stack it in the garage, and slowly turn it back into dust and gas and heat through the winter. The mix of woods is always a bit random. Half hardwood, half softwood. There’s usually some birch, beech, oak, ash and others I couldn’t hope to identify. It’s fun to stack it and see the variation and similarity. You can pretend you’re at Walden Pond. It’s the exact opposite of sitting at a computer. It’s nice. 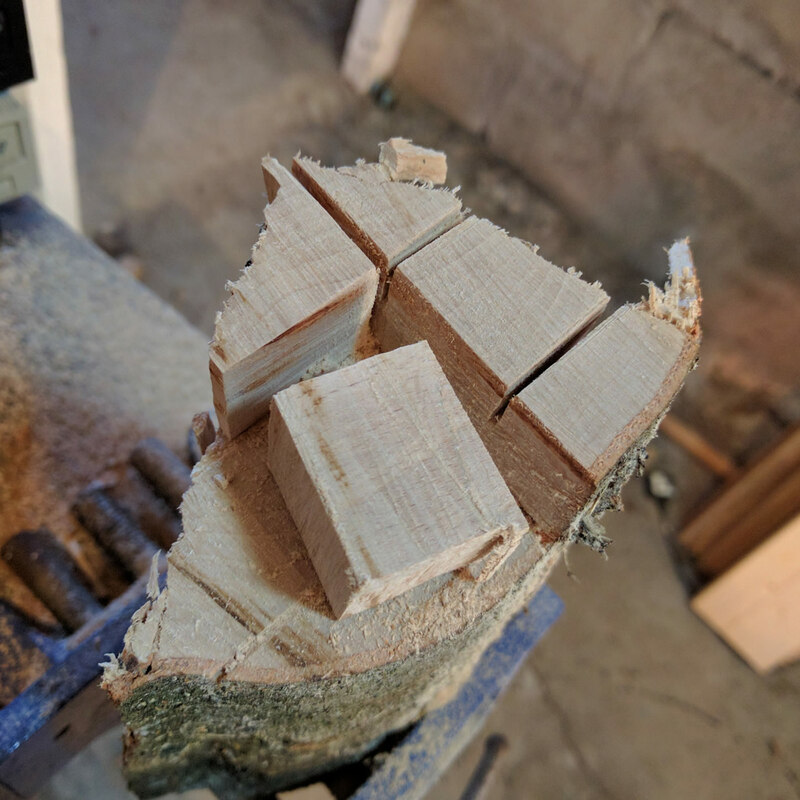 When we started the boardgame a month thing – the boys and I went to the garage and started making some firewood cubes. They wanted to make a different version of Bang!, so while we waited for the blank dice to arrive from ebay we made our own. Home made is more fun – they are wonky, they are unfair, and they are a little disconcerting to use. They also just look wonky. We haven’t used any oils / varnish on them. We ‘nut’ them. Rub a Brazil nut on them to give them a little sheen and stop them getting dirty. The boys spent a while calibrating the dice. Figuring out which numbers were more likely to come up by rolling them again and again. They got to use saws. They learned about different grits of sandpaper, and how the order in which you use them matters. How preparation at early stages pays off by making later stages easier and quicker. 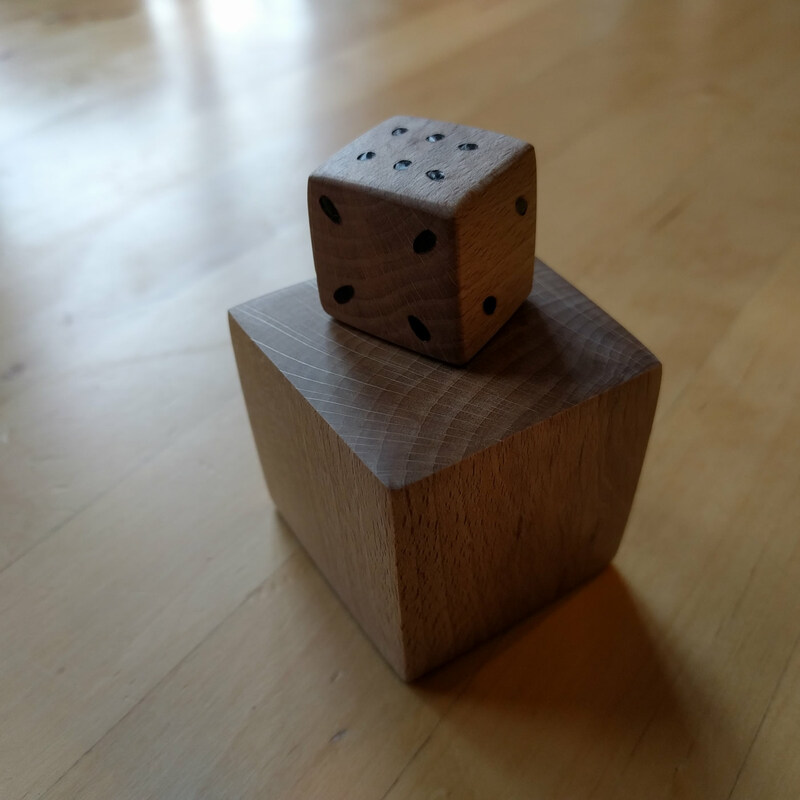 They got to burn themselves on a soldering iron to do the wood burning of the dice dots. They also got to not just play a cool game, but make their own cool game out of a log that would have gone in the fire. Previous Post Boardgame a month?